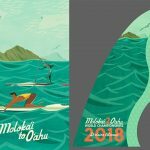 New video released depicting the challenge and triumph of paddling 32 miles across the Ka’iwi Channel to the finish on O’ahu. Unpredictability. It’s a term that can best describe the conditions of any given race day at the Moloka’i-2-O’ahu Paddleboard World Championships (M2O). The goal is clear. Paddlers must navigate the fastest line from the island of Moloka’i to the island of O’ahu, but the channel of water they must cross to reach that goal is constantly changing. At times, it offers a welcomed push of swell that carries racers atop swells that provide the opportunity to surf in the middle of the ocean. And, in the same breadth, the currents shift to push back, demanding each competitor grind for every mile they earn toward the finish of what is considered the apex of paddle culture. A new video is now available depicting the challenge and triumph of pushing toward the finish line, where every paddler experiences an individual championship. What has been predicable is the crowning of the women’s traditional (prone) paddleboard champion Jordan Mercer. For the 21st edition of M2O, the 23-year-old Australian is back to add to her streak of six consecutive victories in the unlimited paddleboard category. A victory for her this year would place her closer to matching or beating the decade of dominance established by her male counterpart Jamie Mitchell who compiled 10 straight wins at M2O before retiring from the race in 2011. In addition to holding the record for most consecutive wins at M20, Mercer also holds the women’s course record in her division of 5 hours, 22 minutes, 31 seconds, which she set on her inaugural crossing of the Ka’iwi Channel in 2011. 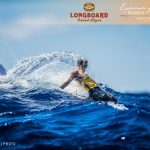 Mercer will likely be fighting off attacks from a trio of talented women who will test the Ka’iwi Channel for the first time in their bid for the championship. Harriet Brown, 27, is the reigning Australian Nutri-Grain Ironwoman champion and a skilled paddleboard specialist. Lizzie Welborn, 18, is one of the youngest athletes to qualify for the Nutri-Grain pro series and arrives with a wealth of experience at the age when Mercer claimed her first M2O title. Danielle McKenzie, 22, hails from New Zealand and holds top finishing times at distance races in Fiji and has an endurance sports background that plays to her advantage. Returning back to M2O this year is Laura Pettigrew, 18, who first crossed the channel at 14 solo and banked some great experience with her two M2O appearances. On the men’s side, it is an Australian assault on this year’s unlimited prone race, driven by Matt Bevilacqua, 25, who is eyeing his third consecutive win after setting a course record of 4:29:32 last year, crushing countryman Jamie Mitchell’s record set in 2011 (4:40:31). Bevilacqua will be challenged by two of his countrymen. One is Daniel Shade, 34, who finished a close second in 2016 in a time of 4:33:28. The other is the formidable Matt Poole, 29, who won the 2014 installment of M2O in less than favorable conditions (4:52:02). In the stock prone category, Australian Stewart McLachlan, 29, is back to defend his title after laying down a punishing, record-winning pace of 5:05:14 last year. In the mix is Lachie Lansdown, 21, who chased McLachlan to a close second in 2016 (5:12:33). 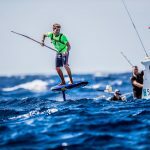 At 21, Lansdown has established an impressive paddleboarding resume at M2O and in Australia – could this be his year? Jack Bark will be chasing down the two Australians. The 23-year-old, two-time M2O champ (2012, 2014) is a constant in this category. A laid back Southern Californian, Bark brings with him the air of comradery for competition. For Bark, M2O is like a day out paddling with his friends rather than a race. But, there is no doubt the glint of a former champion will look to power past the field given his opportunity. In an upset victory last year over the favored Carter Graves, Abby Brown is back to defend the women’s stock prone title (6:29:47). The 19-year-old will once again match paces with Graves who won M2O in 2014 (6:14:41). The two Californians are expected to lead the field, but will be pushed by Australian Maddie Spencer, 20, who is the current Australian Ironwoman Champion. Be on the lookout for Jasmine Smith, 20, from New Zealand who has the potential to surprise field. After several years of battling in the men’s unlimited SUP category, Maui’s Kai Lenny now holds championships and the course records in both the SUP unlimited (4:07:41) and stock (4:22:14) categories. 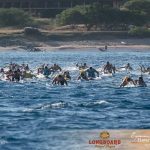 With the conditions to his advantage, Lenny paddled to a tight victory over Australian Travis Grant and fellow islander Connor Baxter who each boast two individual M2O titles in the UL category. Grant, 34, and Baxter, 22, are back to contest this field of talented paddlers, which will be challenged by Australians Lincoln Dews, 21, and James Casey, 25, who both have top-performing results at M2O. Hawaii’s Kody Kerbox, 23, is competing in the UL category this year and could be a factor in the men’s race this year. The men’s stock SUP race will see Polynesian paddler Niuhiti Buillard, 25, defending his 2016 title this year. Last year he defeated two-time champ in the category, Travis Baptiste from Maui. Buillard, captured his first M2O title from Baptisite by just eight minutes last year. Baptiste will not be racing this year, allowing a strong international field improved chances at the coveted title. In the women’s SUP unlimited division, it is the German powerhouse Sonni Hoenscheid, 34, eyeing her fourth consecutive win at M2O. After her introduction to the race in 2013, Hoenscheid has taken command as the women’s top paddler, posting two of the fastest finishing times outside of the course record set by Talia Gangini from Maui in 2012 (4:55:02). The women’s UL race will be spurred by the return of former M2O champ Terrene Black, 33, from Australia and Annabel Anderson, 36, from New Zealand who is challenging the field after her 2015 victory and 2016 second-place finish in the stock category. Anderson’s 2015 victory in the stock category was fast enough to earn her a second-place finish time overall in the SUP division. Former 2010 and ’11 champ Andrea Moeller, 36, from Maui returns to push the women’s field. New Zealander Penelope Strickland, 38, is the sole favorite in the women’s stock SUP category after her 2014 win at M2O. 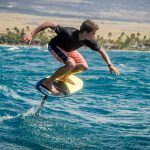 Valued M2O partners include Kona Longboard Island Lager, Duke’s Waikiki, Garmin, Patagonia, Hawai’i Tourism Authority, Waterman’s Applied Science, Futures, Doctor Danger, Blue Rush, Standup Paddle Magazine, DotVision, Ocean Paddler, WND & WVS and Trade Paddleboards. M2O is an open-ocean endurance paddleboard challenge, featuring racers in both the prone and SUP divisions. Connecting the islands of Moloka’i and O’ahu, the 32-mile race crosses the Ka’iwi Channel, also known as the Moloka’i Channel. Men and women from more than 20 countries will face challenging conditions as they navigate the fastest downwind route over one of the deepest channels in the world. Top athletes typically complete the crossing in less than five hours, riding mid-channel waves that can crest more than 12 feet and carry paddlers hundreds of meters at a time. The race starts on Kaluakoi Beach on the north shore of Moloka’i and finishes in Maunalua Bay on the south shore of O’ahu.